O God, who adorned the Priest Saint Raymond with the virtue of outstanding mercy and compassion for sinners and for captives, grant us, through his intercession, that, released from slavery to sin, we may carry out in freedom of spirit what is pleasing to you. Through our Lord Jesus Christ, your Son, who lives and reigns with you in the unity of the Holy Spirit, one God, for ever and ever. Prelates, Kings and Peoples of the Earth! Doctrines of Dominican Theology | J. A. McHugh O.P., S.T.M., Litt.,D. Born in Barcelona, Spain, St. Raymond of Penafort was the third Superior-General of the Domincan Order. He is famous for his work in the freeing of slaves. He wrote five books of Decretals which are now a valuable part of the Canon Law of the Church. The Summa Casuum, which is about the correct and fruitful administration of the Sacrament of Penance, is the most notable of his works. In the 1962 Extraordinary Form Calendar, St. Raymond's feast is January 23. The Church in Canada celebrates the feast of St. Andre Bessette today rather than on January 6 as in the United States. The blessed Raymond was born at Barcelona, of the noble family of Penafort. Having been imbued with the rudiments of the Christian faith, the admirable gifts he had received, both of mind and body, were such that even when quite a boy he seemed to promise great things in his later life. Whilst still young, he taught humanities in Barcelona. Later on, he went to Bologna, where he applied himself with much diligence to the exercises of a virtuous life, and to the study of canon and civil law. He there received the Doctor's cap, and interpreted the sacred canons so ably that he was the admiration of his hearers. The holiness of his life becoming known far and wide, Berengarius, the Bishop of Barcelona, when returning to his diocese from Rome, visited Bologna in order to see him; and after most earnest entreaties, induced Raymond to accompany him to Barcelona. He was shortly after made Canon and Provost of that Church, and became a model to the clergy and people by his uprightness, modesty, learning and meekness. His tender devotion to the Holy Mother of God was extraordinary, and he never neglected an opportunity of zealously promoting the devotion and honor which are due to her. When he was about forty-five years of age, he made his solemn profession in the Order of the Friars Preachers. He then, as a soldier but just entered into service, devoted himself to the exercise of every virtue, but above all to charity to the poor, and this mainly to the captives who had been taken by the infidels. It was by his exhortation that St Peter Nolasco (who was his penitent) was induced to devote all his riches to this work of most meritorious charity. The Blessed Virgin appeared to Peter, as also to blessed Raymond and to James the First, King of Aragon, telling them that it would be exceedingly pleasing to herself and her divine Child, if an Order of Religious men were instituted whose mission it should be to deliver captives from the tyranny of infidels. Whereupon, after deliberating together, they founded the Order of our Lady of Mercy for the Ransom of Captives; and blessed Raymond drew up certain rules of life, which were admirably adapted to the spirit and vocation of the said Order. Some years after, he obtained their approbation from Gregory the Ninth, and made St Peter Nolasco, to whom he gave the habit with his own hands, first General of the Order. Raymond was called to Rome by the same Pope, who appointed him to be his Chaplain, Penitentiary, and Confessor. It was by Gregory's order that he collected together, in the volume called the Decretals, the Decrees of the Roman Pontiffs, which were to be found separately in the various Councils and Letters. He was most resolute in refusing the Archbishopric of Tarragona, which the same Pontiff offered to him, and, of his own accord resigned the Generalship of the Dominican Order, which office he had discharged in a most holy manner for the space of two years. He persuaded James the King of Aragon to establish in his dominions the Holy Office of the Inquisition. He worked many miracles; among which is that most celebrated one of his having, when returning to Barcelona from the island of Majorca, spread his cloak upon the sea, and sailed upon it, in the space of six hours, the distance of a hundred and sixty miles, and having reached his convent, entered it through the closed doors. At length, when he had almost reached the hundredth year of his age, and was full of virtue and merit, he slept in the Lord, in the year of the Incarnation 1275. He was canonized by Pope Clement the Eighth. Patron: Attorneys; barristers; canonists; lawyers; medical record librarians. 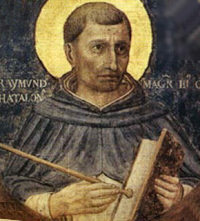 St. Raymond diligently studied Canon Law. Spend some time learning what are the obligations and rights of the laity under Church law. Learn more about the Spanish Inquistion. St. Raymond contributed much to the understanding of the Sacrament of Penance. Make sure your family knows the Act of Contrition and says it every day.